But, what if someone accesses my site using this address? – https://photom.me – the site will not load because the SSL certificate is not installed on the root domain – it is only installed in the www CNAME record of your domain. Thanks to CloudFlare, I will show you how to make https://photom.me redirect correctly to https://www.photom.me. And, on top of this, I will show you how to redirect all links to the https://www.photom.me (of course, replace my domain address with your address). You can add your domain to CloudFlare using their tutorial – don’t worry – it is very easy. During the process, make sure that you use their FREE account – you do not need to pay for any other functionality; it is not required for this setup. CloudFlare will automatically import all DNS records that you have originally set up on your domain registrar. In this tutorial, I will only focus on records that you need to set up to make your domain work with SmugMug and to redirect the non https traffic to https. You will need to set up two CNAME records. As I mentioned at the beginning of this tutorial – I will be using my www.photom.me domain as an example – just replace www.photom.me with your own domain. Make sure that the ORANGE icon is ORANGE – it means that CloudFlare settings are applied to this record. This is required for the redirect to work correctly. Remember to turn the ORANGE icon off by clicking on it once – if you leave the orange icon on for this record – your site will break. That is it – your CNAME records have been added and you can move on to the second part of this tutorial. I know this may sound a little bit scary, but it is not. We need to enable the SSL certificate/crypto on CloudFlare for the naked domain, so it will not give any error messages, when accessing your domain, without www at the beginning of your site link. 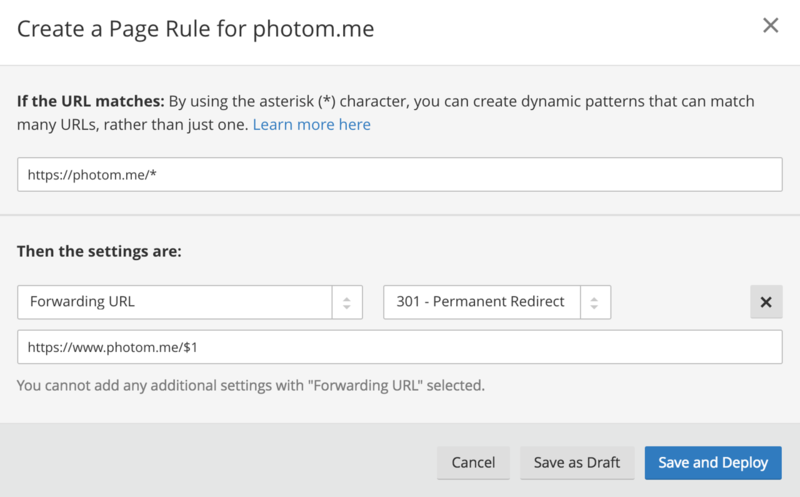 We will use CloudFlare’s Page Rules to set up rules that will redirect all naked domain traffic to the www version of your url – which has SSL enabled. Even if someone enters: https://photom.me/yourgallery – they will be redirected to – https://www.photom.me/yourgallery – so the whole url will be redirected not just the root domain – which is perfect, because your old links will also work, if someone forgets to add the www at the beginning of the url. 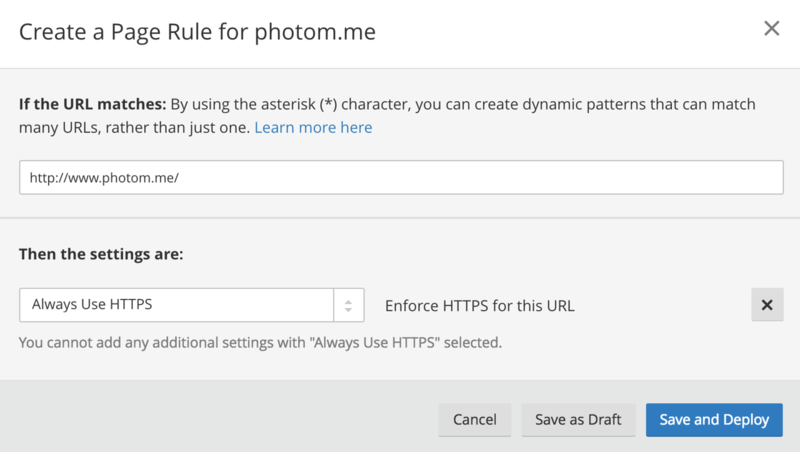 In here we will setup two page rules – the first rule is for your domain to always use https. Of course, replace my site link http://www.photom.me with your domain url. After filling in both fields – click the SAVE AND DEPLOY button. The second rule will be to tell cloud flare to redirect all naked domain links to the www version of your domain. The first field should have your root domain with https at the beginning and /* at the end. The /* means that anything behind the / should be included in the redirect. I have already set this up on my domain – it works, so you can test it and see what I mean. That is it! Your redirect is ready! Please be aware that these changes may take up to 24 hours to work on your domain – so make sure you give this a little bit of time.